Carlos Arenillas(1) | On June 10 there will be a referendum in Switzerland, something which is quite usual in this confederate State. But this one is particularly interesting. In this country, famous for its banks, the citizens will be consulted on a very sensitive issue: money. The promoters have managed to achieve the conditions established by the Swiss Constitution to hold the referendum. It is being driven by the NGO Monetäre Modernisierung (monetary modernisation), also known as MoMo, and its slogan is Vollgeld (2) (sovereign money according to the English version of its website). I won’t hide my sympathy for the proposal from the reader. If the referendum is successful, the Swiss Constitution would be modified to include an important change: a monetary reform. Its success is complicated because the central bank, Parliament and the banking sector are against it. But the fact the referendum is being carried out is a victory for its supporters and fuels a debate which is gaining momentum at an international level. Under the current monetary system, money available to society (monetary supply or M1) is defined as the sum of the notes and coins in circulation plus demand deposit accounts in private banks. The State creates the notes and coins via its central bank, but the digital money which appears in citizens and companies’ bank accounts is basically created by the banks every time they grant a loan (3). The money supply, available money or money in circulation, is reduced every time a loan is amortised or the central bank withdraws notes and coins from circulation (the latter is almost impossible). The current proportion of these two components in the money supply is: 10% notes and coins and 90% digital money in bank accounts. 1) That the Swiss central bank is the only organisation authorised to create money. Not just notes and coins as it currently does, but also the electronic or digital money which appears in current accounts. 2) That creating money is a separate activity from granting loans. The banks will continue to offer services they currently supply for private and corporate clients (banks accounts, payment services, loans etc.). But they would not be able to create money via the concession of a loan, which is the case at the moment. To be able to grant a loan, they would have to borrow the money from someone who already has it. 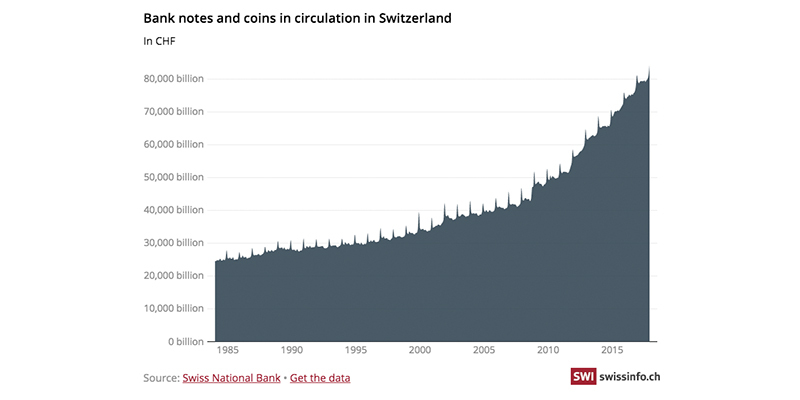 If the monetary reform proposal is approved, 100% of the money – physical or digital Swiss francs – would be exclusively created by the Swiss State via its central bank. So the creation of money which is currently 90% privatised would become 100% public. That’s where the name sovereign money comes from. The economy’s growing debt, an inevitable consequence in the current system for creating money via credit, would be modified and the recurrent banking crises of the last decades would be fairly unlikely. The current accounts of citizens and companies would no longer be at risk every time a bank enters a crisis (runs on banks and bail in). It would not be necessary to prop up banking activity with substantial amounts of public money via guarantee funds or bail-outs. These are a public subsidies which are not awarded to any other business activity. The benefits of money creation, like seigniorage, would be an income item for the State in its entirety. The Government could use these additional revenues to cut taxes, reduce public debt, finance infrastructures and public services, or pay a dividend to its citizens. The reform of sovereign money would reduce the economy’s liquidity and credit, as it would prohibit the transformation of maturities which the banks carry out with the creation of demand deposit accounts when they grant a loan. It would mark a historic change to the system. 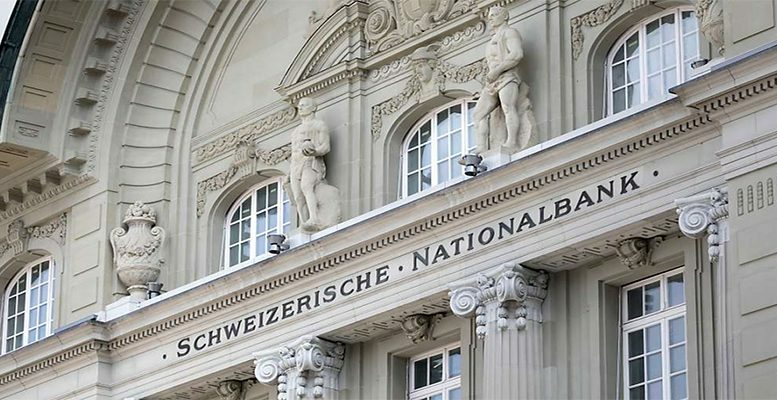 The Swiss central bank would fundamentally stop being the bank of the private lenders, and in part of the State, to become the bank for all citizens and companies as well. And they don’t consider that as desirable. It would not guarantee that financial stability problems would disappear. They accept that the number of purely banking crises would be reduced, but there would still be financial crises. The Swiss central bank would once again manage the money supply directly, something which it stopped doing decades ago. It would control the amount of money and not the interest rate, as it does at the moment. The Vollgeld proposal is not new. Since the Great Depression there have been other similar ones, although not identical. The most famous one was that of Irving Fisher, along with a group of economists in 1936, known as the Chicago Plan (5). It was presented to President Roosevelt but was never approved. This monetary reform already proposed separating the creation of money from the concession of credit. It imposed bank deposits being 100% guaranteed by central bank reserves (narrow banking). They defended that the advantages of such a system would be: a) improved control over the fluctuations in economic cycles, b) the end of runs on the banks, c) the rapid reduction of net public and private debt as there would be no need for the creation of money to lead to the creation of debt via bank loans. Other similar proposals were put forward by economists later, some of them Nobel prizewinners, like Milton Friedman (1965) and James Tobin (1987). As a result of the Great Recession in 2008, and its painful and costly consequences, new proposals for monetary reform have emerged. They seek a solution for financial instability and for the problems in the banking and financial system, but taking into account the characteristics of the new era: the digital revolution which technology has brought with it and the growth in new forms of financial activity (shadow banking). Worthy of highlighting are the proposals of movements like Positive Money in the UK, the aforementioned MoMo in Switzerland, The Monetative in Germany etc (6). The opaqueness and complexity of the monetary and financial system and its tendency to create credit bubbles are behind the recurring financial crises. There are successive attempts to regulate and stabilise it. The Vollgeld proposal, and others like it, are part of this aspiration. But they are rejected by those responsible in the public sector and by banking associations which, for the time being, prefer to continue with more and more complex regulations, and avoid facing a monetary reform. But this can change, either due to growing demand from citizens, or because of a new financial crisis. There is an increasing number of central banks looking at this issue, particularly with regard to the question of a public digital coin (Central Bank Digital Currency or CBDC). The politicians and private banks need to pay more attention. In light of what has happened in the last few years, questions like the following arise: who should create the money and how should it be distributed? Why can’t citizens and companies have access to their central banks? Or have access to safe money at least in nominal terms? These are questions with a strong democratic element which is difficult to ignore. The refusal to discuss a monetary reform, very much linked to the lack of knowledge and interests created, needs to be overcome. Studying and talking about this matter would help society to better face a future which is always uncertain. But one which we should not face with the ignorance and improvisation we had when the 2007 crisis erupted. (1) Economist. He was president of CIMD and Intermoney, vice president of the CNMV and advisor for the Bank Of Spain. (3) The central bank also creates digital money when it purchases financial assets via the quantitative easing , which basically increases bank reserves. This digital money, banking reserves, along with the banknotes and coins in the hands of the people mean the monetary base and it should not be confused with the money supply. They are different concepts although related.